“ProFont Distribution” is Copyright © 1997, SQ Software. The ProFont fonts are Copyright © 1997, Carl R. Osterwald. It is our intention that “ProFont Distribution” get the widest possible distribution. You may redistribute unmodified copies of “ProFont Distriubtion” as long as it is accompanied by an unmodified copy of “About ProFont Distribution 2.2” (this file). You may not charge anyone money for the “ProFont Distribution” package itself. The “ProFont Distribution” package can be distributed for free along with products for which you do charge money. The “ProFont Distribution” package can also be distributed for free as part of collections of more than 10 third party products sold as a collection (such as on the Apprentice CD series). If you do distribute “ProFont Distribution” along with another product or as part of a collection, Stephen C. Gilardi and Carl R. Osterwald would appreciate very much each receiving a complimentary copy of the whole distribution (e.g., any CD-ROM it appears on), but this is not a requirement. If you have questions about redistribution, please contact Stephen C. Gilardi at squeegee@usa.net. ProFont began life as a better version of “Monaco 9” which is especially good for programmers. It was created circa 1987 by Andrew Welch. In version 1.1 of the ProFont distribution, ProFont ceased being just a 9 point bitmap font. Carl Osterwald contributed bitmaps at several larger sizes and an outline version of ProFont in both TrueType and Adobe Type 1 (ATM) formats. In version 1.2 of the ProFont distribution, Carl extended ProFont to include the entire Macintosh character set including accented characters with ASCII codes from 0x80 to 0xFF. In version 2.0 of the ProFont distribution, Carl provided an ISOLatin1 encoded version of ProFont. The shapes of several of the characters have been modified for improved readability, and a 7 pt bitmap version of ProFont is included. 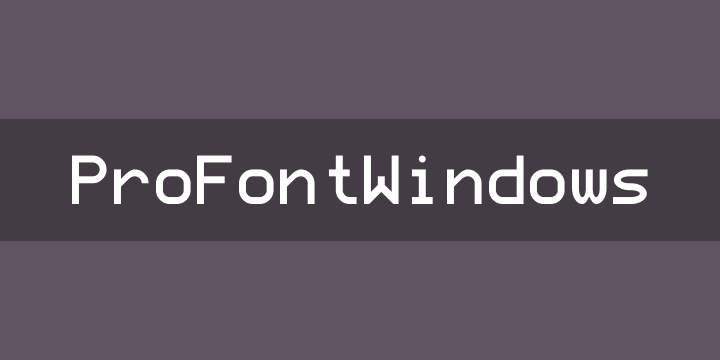 In version 2.2 of the ProFont distribution, Carl produced a version of ProFont that uses the Windows character set. Once again the shapes of several of the characters have been modified for improved readability—especially when the fonts are anti-aliased.